Description: Colonies consist of irregular globular masses. Colour is dirty-yellow to olive green, with a certain amount of adhering detritus, sand etc. The zooids are irregularly arranged around common cloacal openings. 10-15mm thick by 20-50mm across. Habitat: Especially common in rapids in upper infralittoral, in surge gullies and exposed places. 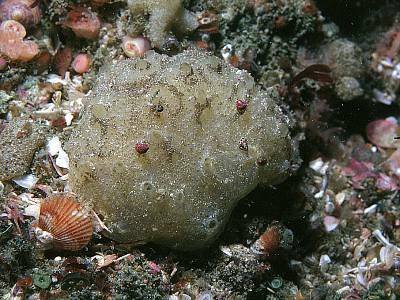 Often attached to kelp stipes and algae, also on rock. Recorded from lower shore to 100 m.
Ecology: Larvae are produced from May to October. The colony regresses into an overwintering phase when it divides and reproduces asexually before beginning to feed again in the spring. Distribution: Generally distributed all round the British Isles and from Norway to the Mediterranean. Similar Species: Has been much confused with Synoicum incrustatum and Synoicum pulmonaria. S. incrustatum never forms such large colonies and is always heavily encrusted with sand. Synoicum pulmonaria has a regular arrangement of zooids around the cloacal openings. Irregular masses with several cloacal openings. Internal anatomy, with smooth rounded stomach and twisted gut. Picton, B.E. & Morrow, C.C. (2016). Polyclinum aurantium Milne-Edwards, 1841. [In] Encyclopedia of Marine Life of Britain and Ireland.